Monday, May 16, 8:45 – 10:30 a.m. This session will contextualize critical thinking theory and research-based practices within the topic of the engaged lecture. What we learn well, we learn by doing. Despite our experiences sitting in seemingly countless didactic lecture settings, much of what we have come to deeply understand has been through action: conversations, study groups, mentoring relationships and situations, case studies, problem solving, and so on. Nonetheless, the lecture dominates classroom pedagogy, functioning under the assumption that exposure to information and the instructor’s reasoning are sufficient for establishing the foundation necessary to guide student actions toward intellectual sophistication. We want to challenge this, and related, assumptions. This featured session is designed to take a practical approach to what is institutionally established and expected. We will not abandon the lecture; rather, we will embrace it. We will explore accessible ways to challenge students to think critically and to directly engage with our course material in dynamic ways as we lecture. This exploration will involve working through a variety of engaged lecture strategies that model best teaching and learning practices that, once contextualized, can readily be transferred to our next lecture learning experience. We will work toward two goals: (1) explicate and apply in the lecture setting the foundational principles of critical thinking concepts and principles drawn in part from the work of Dr. Richard Paul and Dr. Linda Elder, among others; (2) highlight and contextualize best teaching and learning practices that help critical thinking principles become tangible actions for fostering deep learning. You will leave this experience with resources: human, intellectual, and strategic. This session will engage you in thinking about your instruction with a new lens of the critical thinking polarities. The late Dr. Richard Paul espoused seven polarities as central to a critical system that can guide your thinking in how you design instruction and engage learners. 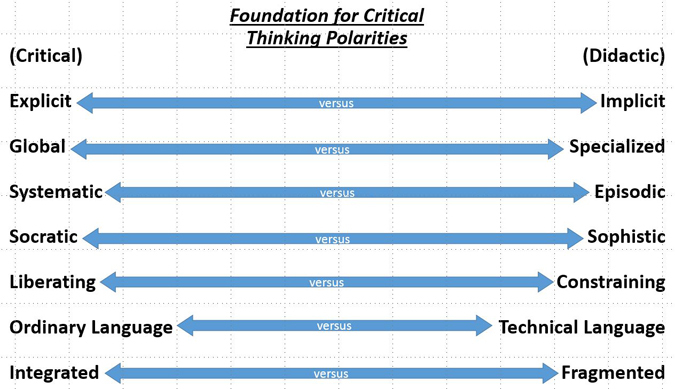 The polarities provide benchmarks and practical tools to enrich teaching and learning activities across the disciplines. In this session, you will explore this system as an avenue for moving beyond familiar didactic teaching strategies so that you may become more intentional in fostering an environment of criticality and engagement with students. Dr. Barnes will guide you through an active exploration of selected polarities while providing structured activities so you can reflect, write, and dialogue with those at your table about how you may apply the logic of the polarities in your own instructional context.